About the Event Location Why Hike? On Saturday, May 4, we'll hike William B.Umstead State Park to raise money for our many Cause for Paws NC medical cases! We have an option for hikers of all experience levels-- bring your dog and challenge your team with the three mile trail .... meander an easier one mile path .... or support CFPNC from the comfort of your home (or out of state!) as a "Virtual" hiker! We will be hiking on the Sycamore trail and checking in at the Crabtree Creek Shelter #1. More details will be sent to all registered hikers as we get closer to the event start date. 10am pre-hike stretch and then HIKE! Children 12 & under and dogs hike free, however donations on their behalf are welcome. Why support Cause for Paws of NC? For Jorja. 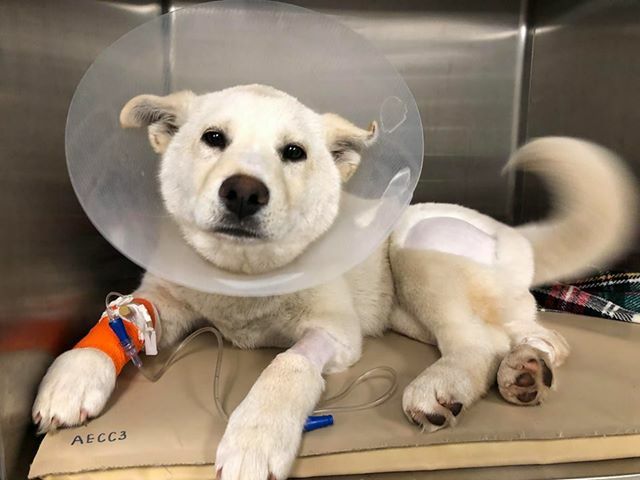 She was the first medical case of 2019 -- a sweet puppy hit by a car and picked up by Animal Control. The shelter called Cause for Paws and we were able to meet them at urgent care .... and then finance major surgery for this pup. Hike for Hounds is CFP's largest fundraiser. It helps raise money to pay for major medical expenses which include urgent care visits, surgeries, heartworm treatments and specialists. CFP has become known as a rescue willing to take in the hardest cases which often comes with a hefty price tag. Please support us: start a team and challenge your family and friends to join you! They can hike with you or join as a "virtual hiker" -- an option that allows your team to reach well beyond North Carolina. In 2018, we had "virtual hikers" from California to Pennsylvania! Registration fees are tax deductible as CFP is a 501(c)3 nonprofit. So please join us May 4 and join The Cause -- for dogs like Jorja. For any questions or additional information, please contact us via email at hikeforhounds@cfp-nc.org.